Families have been enjoying the Bunker Hill Day parade for years and years. The parade route is all around Charlestown, and is held on the Sunday before, or on June 17 each year. 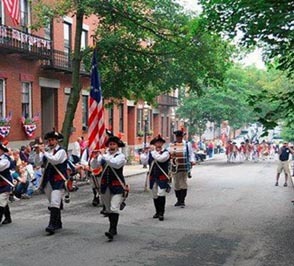 A tradition since 1786, the Bunker Hill Day Parade commemorates the Battle of Bunker Hill which was fought on Breed's Hill on June 17, 1775 in Charlestown, Massachusetts. The Battle of Bunker Hill was the first major battle of the American Revolution. The annual Bunker Hill Day parade is a family event with a route all around Charlestown. Parade begins at the intersection of Vine and Bunker Hill St. and down Main street, and concludes on Winthrop St. by the Charlestown Militia Training Field. Bunker Hill Day marks the anniversary of the Battle of Bunker Hill, also known as the Battle of Breed's Hill, on June 17 each year. This battle, which occurred in 1775, was part of the Siege of Boston. This siege took place during the American Revolutionary War, which is also known as the American War of Independence. Check out the Bunker Hill Parade Facebook page for more information on the entire week's activities (June 9 - 16). Parade forms at the corner of Vine & Bunker Hill Streets in Hayes Square, Charlestown, and goes through the streets of historic Charlestown, Massachusetts ending at the Training Field.